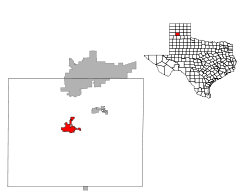 Canyon is a city in, and the county seat of, Randall County, Texas, United States. The population was 13,303 at the 2010 census. It is part of the Amarillo, Texas, metropolitan statistical area. 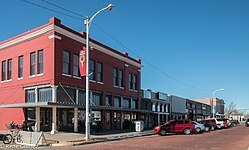 Canyon is the home of West Texas A&M University and Panhandle–Plains Historical Museum, and the world-famous outdoor musical drama Texas. Canyon was founded by L.G. Conner. East of Canyon is the JA Ranch, founded in 1877 by Charles Goodnight and John George Adair and still under the ownership of the Adair heirs. According to the United States Census Bureau, Canyon has a total area of 4.9 square miles (13 km2), all land. The city itself lies in a valley that eventually becomes Palo Duro Canyon to the east. 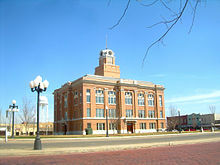 Randall County Courthouse in downtown Canyon, Texas. At the 2010 census, there were 13,303 people, 5,185 households and 2,924 families residing in the city. The population density was 2687.47 per square mile (1,037.68/km2). There were 5,611 housing units at an average density of 1,133.54 per square mile (437.68/km2). The racial makeup of the city was 88.5% White, 2.4% African American, 0.7% Native American, 1.8% Asian, 0.1% Pacific Islander, 4.7% from other races, and 2% from two or more races. Hispanic or Latino of any race were 15.7% of the population. There were 5,185 households of which 27.8% had children under the age of 18 living with them, 42.5% were married couples living together, 10.2% had a female householder with no husband present, 3.6% had a male householder with no wife present, and 43.6% were non-families. 31.8% of all households were made up of individuals and 8.9% had someone living alone who was 65 years of age or older. The average household size was 2.32 and the average family size was 2.99. 21.4% of the population were under the age of 18, 18.6% from 20 to 24, 22.3% from 25 to 44, 15.3% from 45 to 64, and 9.6% who were 65 years of age or older. The median age was 25 years. For every 100 females, there were 93.6 males. For every 100 females age 18 and over, there were 90.5 males. The median household income was $32,361 and the median family income was $46,250. Males had a median income of $34,338 versus $25,255 for females. The per capita income for the city was $16,292. About 8.1% of families and 14.3% of the population were below the poverty line, including 10.2% of those under age 18 and 10.3% of those age 65 or over. Public education in Canyon is served by the Canyon Independent School District. Currently, The only high school is the Canyon High School, whose mascot is an Eagle. Some students in Canyon, TX play soccer at the Brown Road Soccer Complex on the west side of town. Intermediate School and Junior High students playing soccer at Brown Road Soccer Complex in Canyon, TX. J. Evetts Haley, a historian of the American West, lived in Canyon and later Midland. Georgia O'Keeffe, famous artist, first lived in Amarillo (1912–1914) and then Canyon (1916–1918), having been inspired by the natural beauty of the Palo Duro country. Brandon Schneider, women's basketball head coach at the University of Kansas; born in Canyon. Candace Whitaker, women's basketball head coach at Texas Tech; born in Canyon. Roy Whittenburg, businessman, newspaper publisher, and U.S. Senate candidate in 1958; died in Canyon in 1980. Palo Duro Canyon State Park is twelve miles east of Canyon. ^ "Canyon History". Canyon Chamber of Commerce. Retrieved 13 March 2017. ^ "HISTORY of the JA, THE RITCHIE FAMILY and the JA FAMILY". ranches.org. Retrieved 13 March 2017. Wikimedia Commons has media related to Canyon. This page was last edited on 28 March 2019, at 04:36 (UTC).